When a character is as cool as One Piece’s Trafalgar Water D. Law, you want to carry a piece of them with you whenever you leave the house. T-shirts, pins, cell phone straps – all adorned with your heroes’ motifs – are the way to go. And if you can keep the sun out of your eyes while showing off where your loyalties lie, why not? 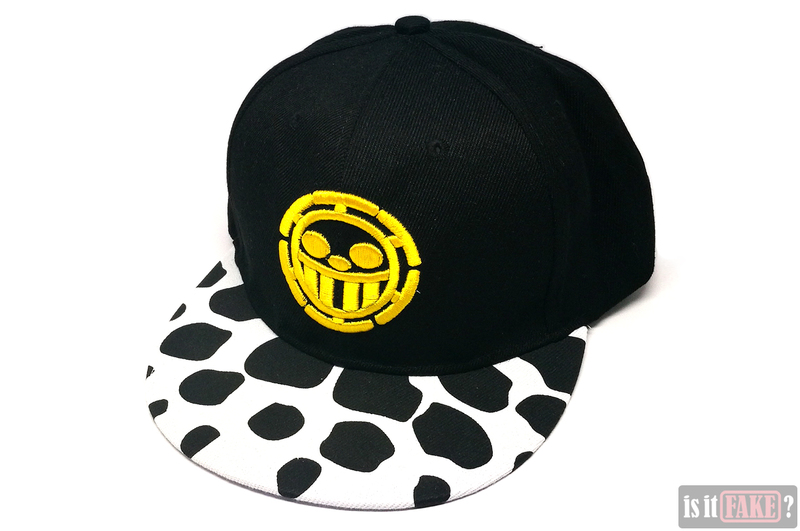 It’s for this reason headwear is a popular choice among anime fans. But because hats and caps are easier to produce than other merchandise, we’re seeing a proliferation of fake headwear in physical and online stores. There are a couple of ways of spotting fake headwear, and you’ll learn some of them in today’s article. 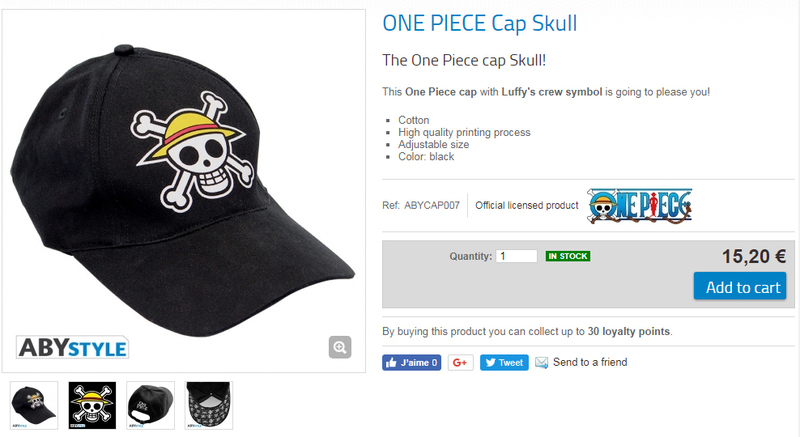 If you’re going to shop online for licensed merchandise, it’s a swell idea to distance yourself from Chinese online marketplaces such as AliExpress. More often than not, these sites serve as sanctums for bootleggers, so visit them at your own peril. 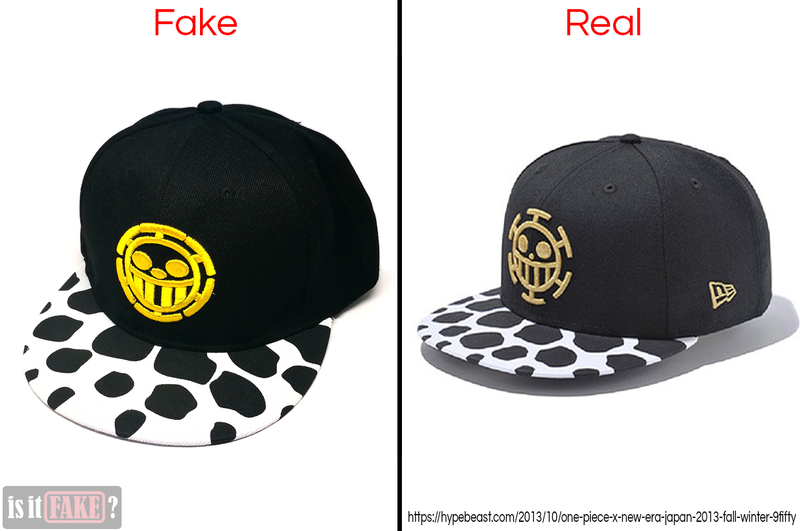 The store we bought this fake One Piece Trafalgar Law sports cap from listed LUOGEN as its brand. Research on LUOGEN, however, amounts to nothing resembling a legit company. Whoever they are, they don’t have an official website. What you will find are LUOGEN products sold exclusively in Chinese online stores – a bad sign, indeed. 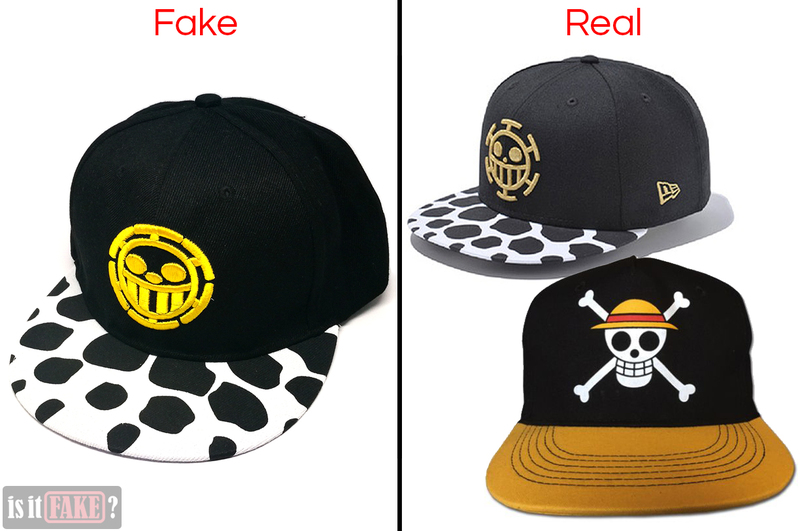 The fake Trafalgar Law sports cap was delivered to us wrapped in plastic. Neither the cap nor the plastic bears a brand name. No mention is made of Toei Animation (the studio behind the TV animated series), Weekly Shōnen Jump (the magazine that regularly features the manga), Viz Media (the manga’s English publisher), or the array of companies legally manufacturing and/or distributing One Piece merchandise. 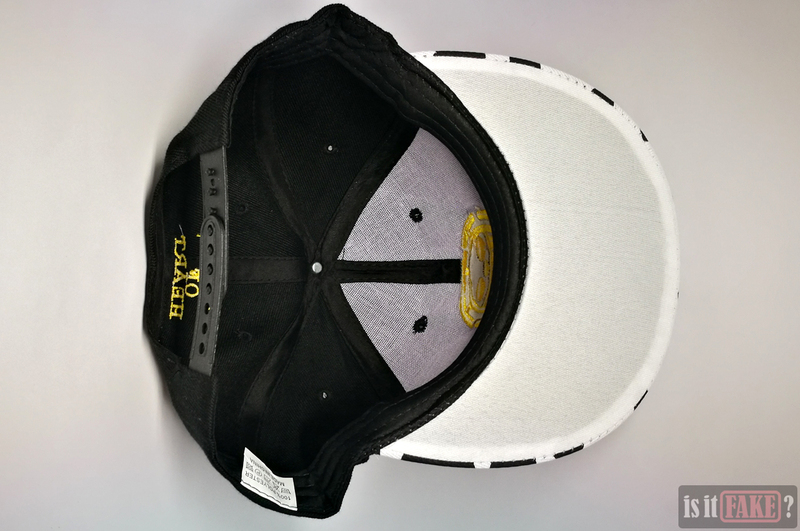 From the images above, you’ll observe some of the fake cap’s eyelets, instead of being clean holes, are crisscrossed with thread. 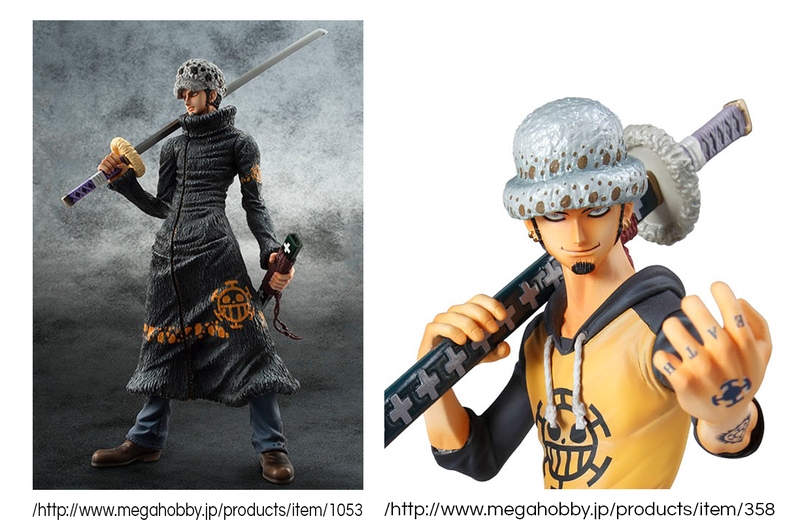 The fake cap’s visor bears a cowhide-like motif resembling the one found on Trafalgar Law’s fur hat, as you can see on the official cap and Megahouse’s official Trafalgar Law statue. That’s all well and good. 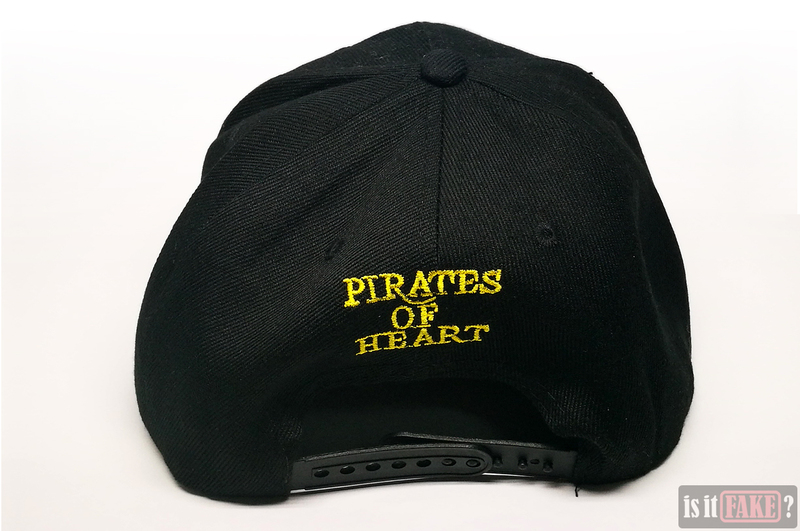 But then you look at the Heart Pirates logo on the fake cap, and notice that something is off. 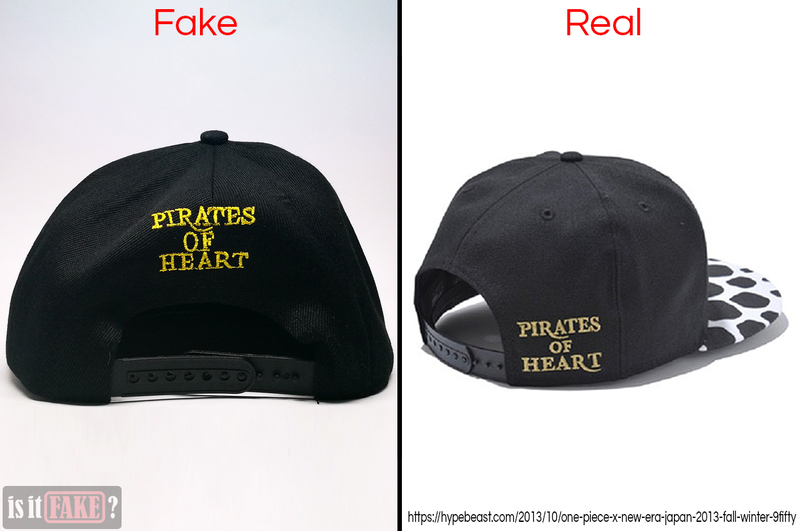 Compare this to the real Heart Pirates logo on the official cap and Megahouse’s Trafalgar Law figures. And now we see the fake logo’s problems: the lines are too thick; the spokes are too close to each other and to the skull; the eyes and nose are too big, and are oval instead of circular. In short, the fake logo is bloated. The fake logo only has four teeth (and a huge gap in the middle), whereas the official has five. Lastly, the fake cap is missing the New Era logo, which can be found on the official cap’s left side. New Era is an official American manufacturer of sports caps. 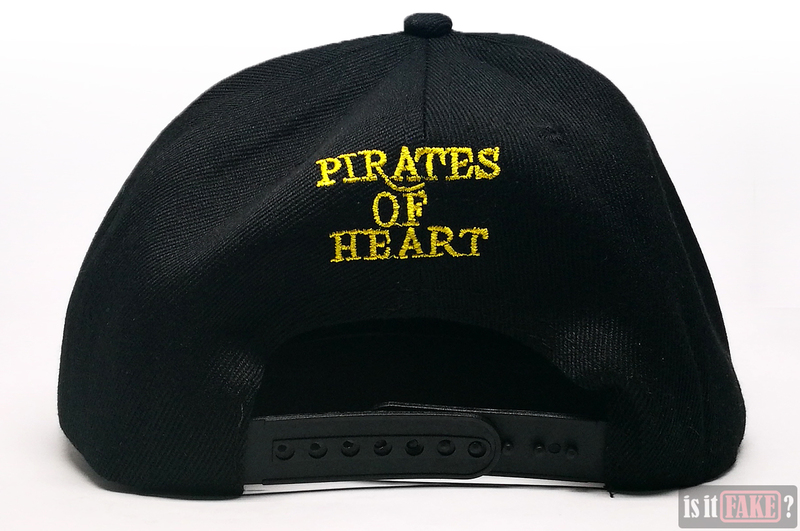 When we turn the cap around, we see the words “Pirates of Heart” emblazoned on the back. 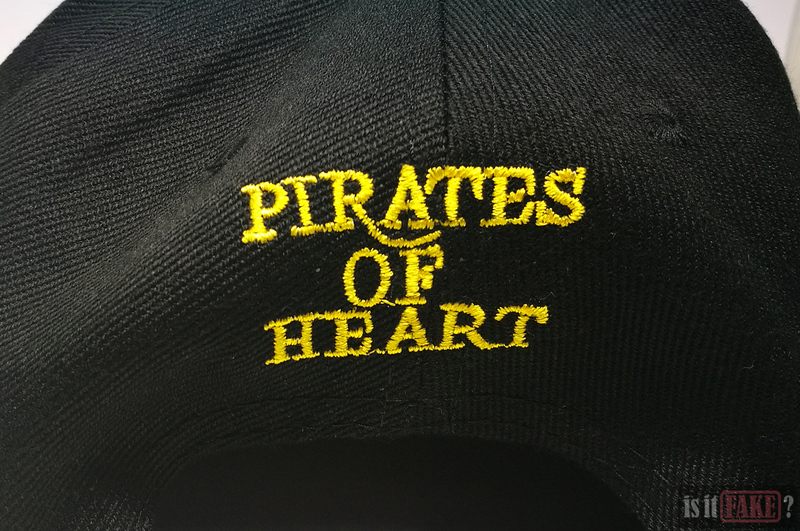 The position of the “Pirates of Heart” text differs between the fake and official caps. 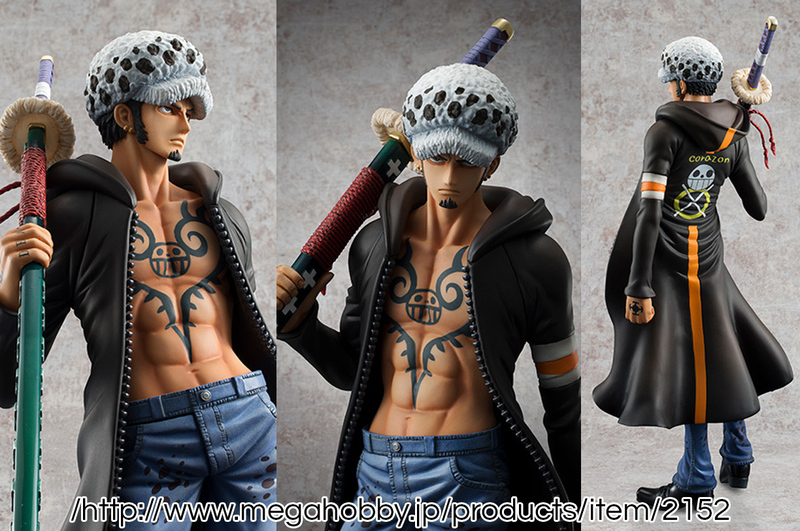 On the fake, both the “Pirates of Heart” text and Trafalgar Law logo are marked by messy knitting, complete with uneven edges, black gaps between threads, and tiny coils of fabric springing out in several places. 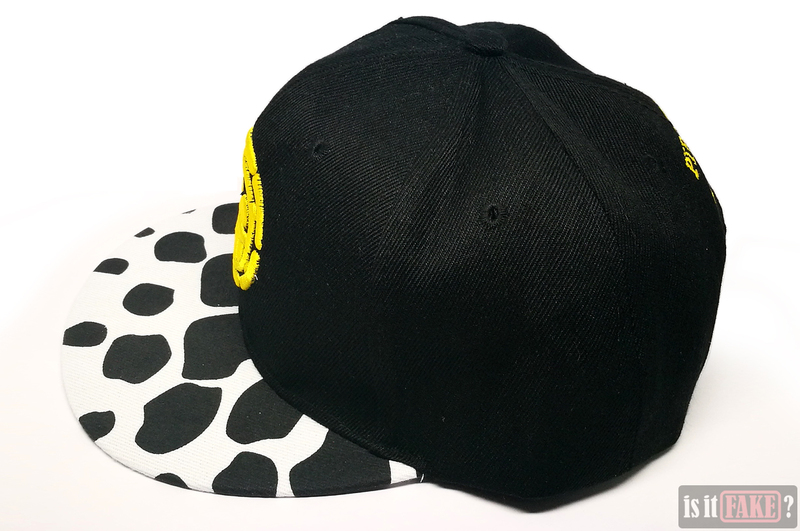 Additionally, the fake cap’s crown and panels are misshapen. The panels are extremely soft; they can be collapsed with ease without the support of your skull. 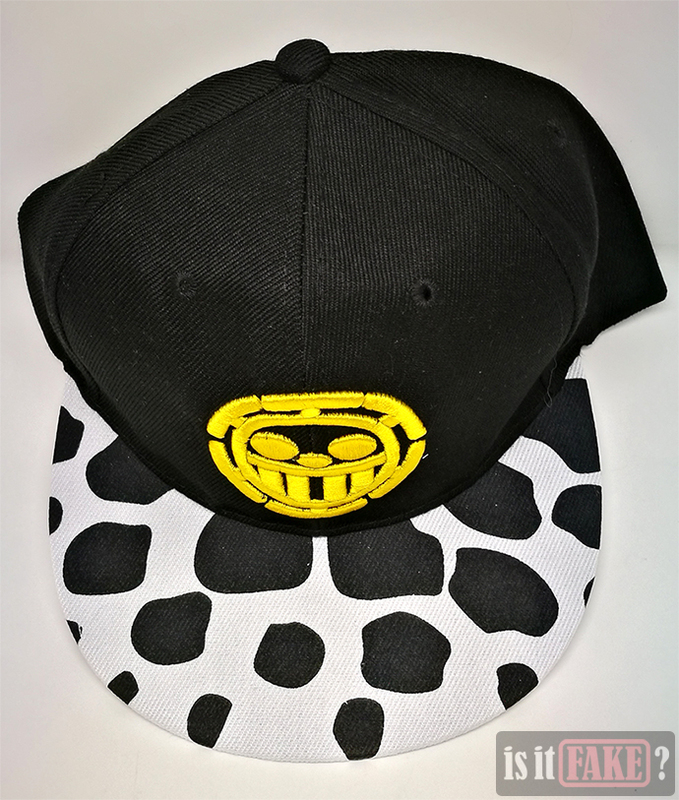 In contrast, the official cap’s crown and panels are stiffer, so that the item retains the sports cap’s basic round shape whether or not it’s sitting on someone’s head. 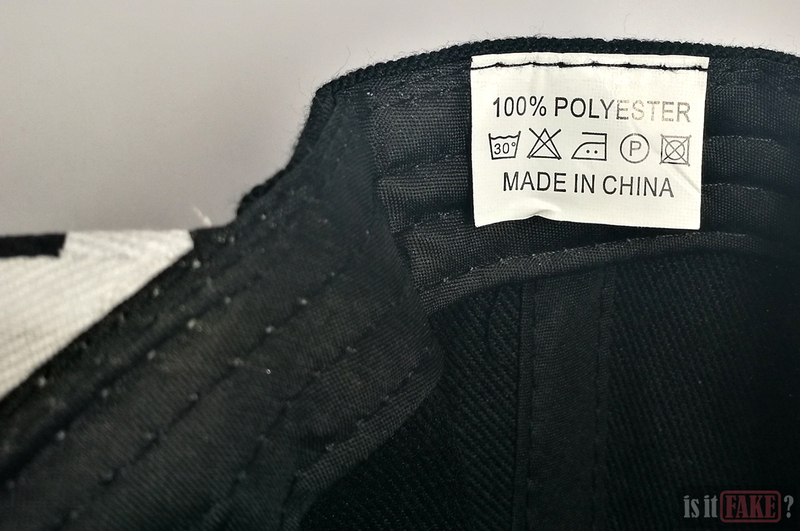 There isn’t much else to see when you look at the cap from below, except for a tag stating the fake cap was made in China. 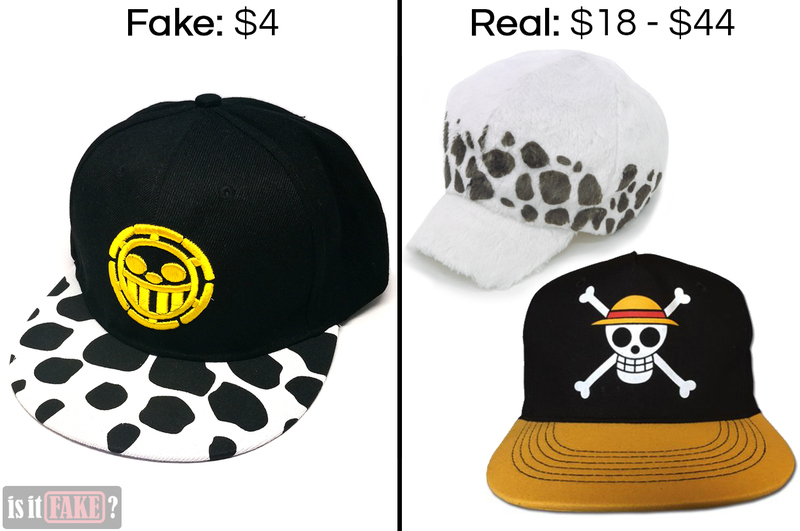 Licensed One Piece headwear are slightly more expensive than the fake, but they do boast better quality, and feature show-accurate designs and emblems. 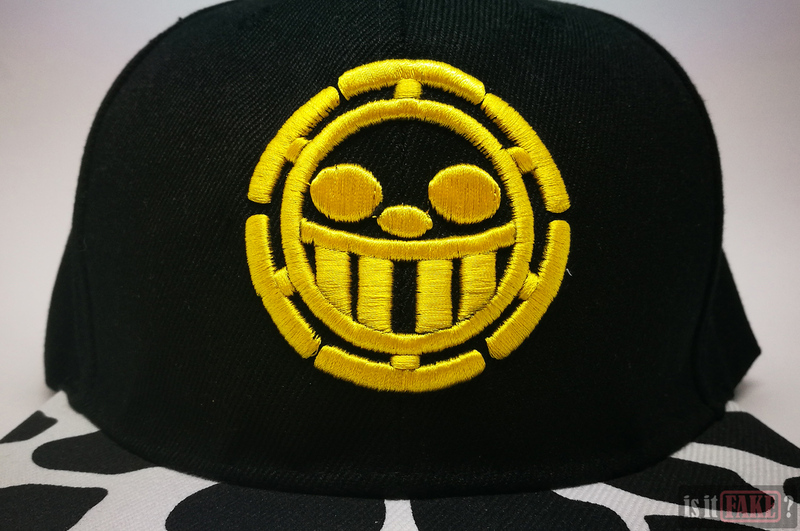 If you want to own licensed One Piece headwear, look for official One Piece merchandise manufacturers and distributors. The New Era cap on which the fake was based was produced way back in 2013, so you’d be extremely lucky to find it in legit online stores. While these caps seem available on Amazon, they’re all being sold by third-party sellers, so there’s a good chance you’ll end up purchasing a fake. Unless you have evidence that the seller is 100% legit, stay away from them. 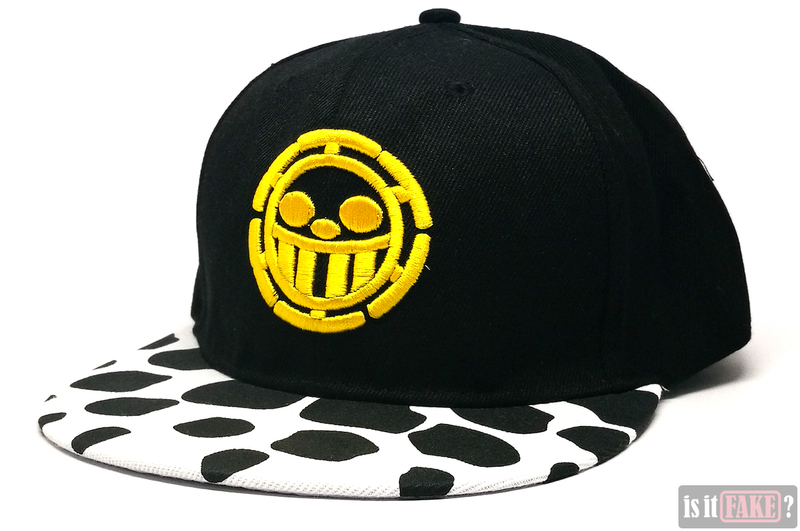 The good news is there are still lots of companies making One Piece-themed apparel. For instance, there’s ABYstyle, a European manufacturer of anime items. 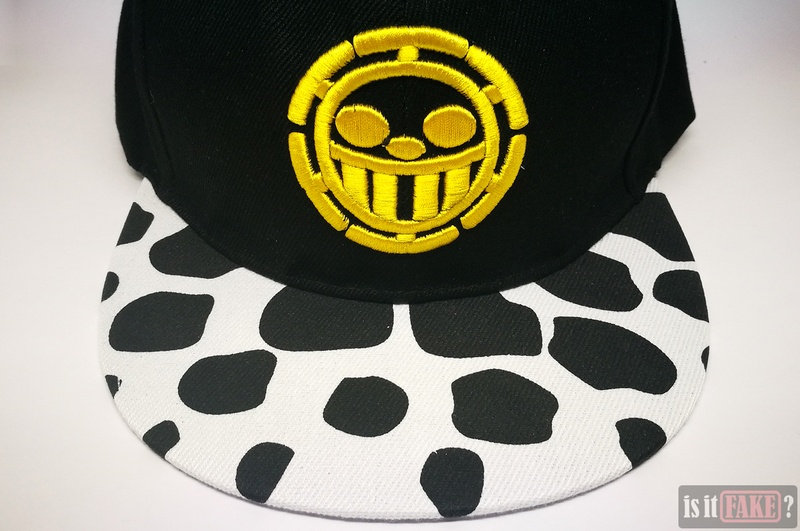 You can find One Piece sports caps, such as this and this, in their online store. You can also find them in Abysse Corp’s store – just click here and here. 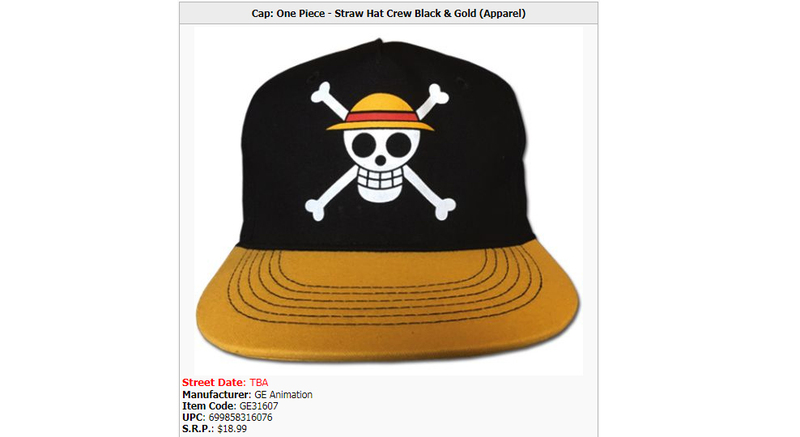 Licensed manufacturer of anime items Great Eastern Animation has a plethora of One Piece hats and caps. Some of them are even designed to look like the headwear donned by the characters in the anime and manga, making them great for cosplay. 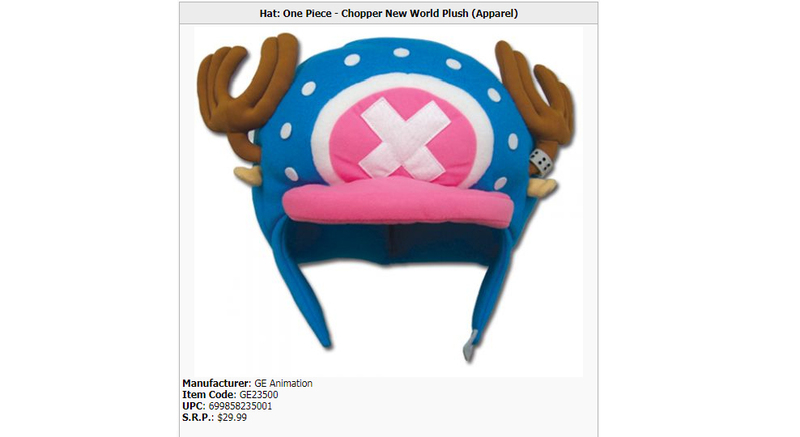 AAA Anime store, a legit distributor of anime products, has lots Great Eastern Animation One Piece headwear. This, this, and this are just three of them; search the store itself for more. 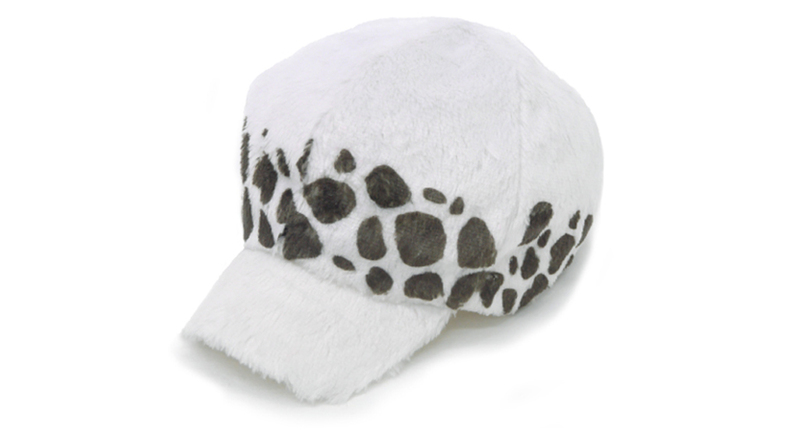 Then we have Cospa, a Japanese company that produces premier cosplay items, such as this lovely Trafalgar Law fur hat. 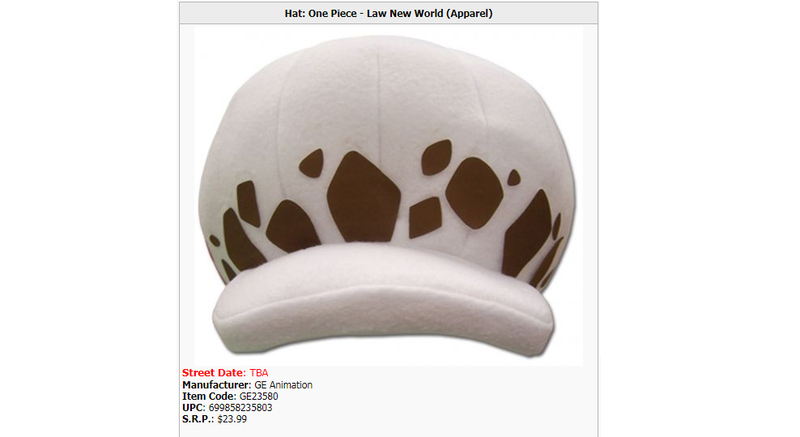 It’s a tad pricey at around $44, but it should go well with your Trafalgar Law cosplay, if that’s your thing. If you’re in Japan, you can also visit one of the many Mugiwara stores for official One Piece merchandise, from toys to apparel. 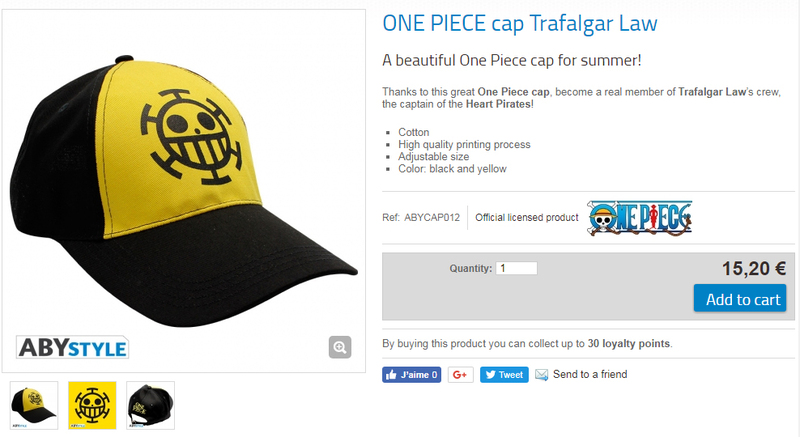 This fake One Piece Trafalgar Law sports cap is the very definition of mediocre. With its swollen logo, it does a poor job of representing the IP it’s based on. 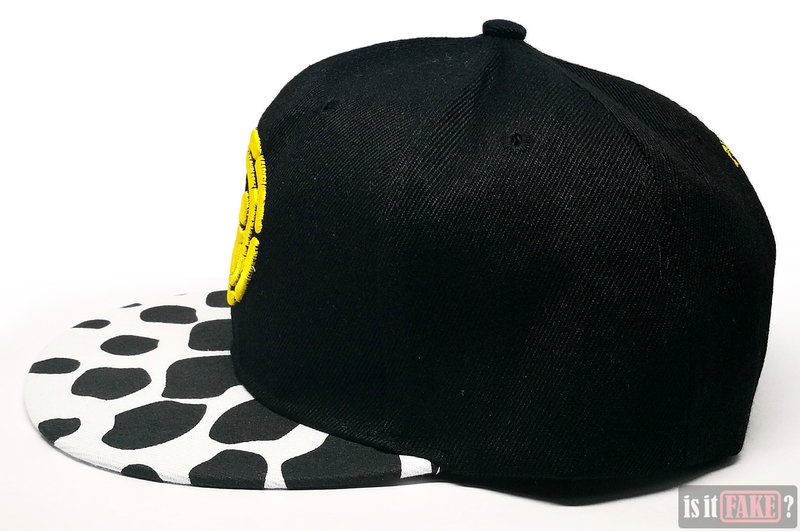 With its misshapen body and messy stitching, it makes for an ugly sports cap. For these reasons, it deserves no less than a 65% terrible rating.